Would it be possible to get a Not a dupe flag, for questions which have been closed as duplicate? Every now and again I'll see a question that are completely different, and definitely not dupes. A new flag would save me typing in the Other box every time. The "vote to reopen" feature already exists, and is available to users with 3000 reputation or more. You get it bundled in the privilege to cast votes - be it to close or reopen. Before that, all you can do is as you've done up until now; flag, and write a clear explanation in the Others field. This is exactly why we have reopen votes. If a question is closed (by mistake/oversight) users with the privilege can vote to reopen the question. On (Meta) Stack Overflow you will need a reputation >3k to obtain this privilege. You can flag such closed question; and add custom comment in the needs moderator attention section. Not the answer you're looking for? 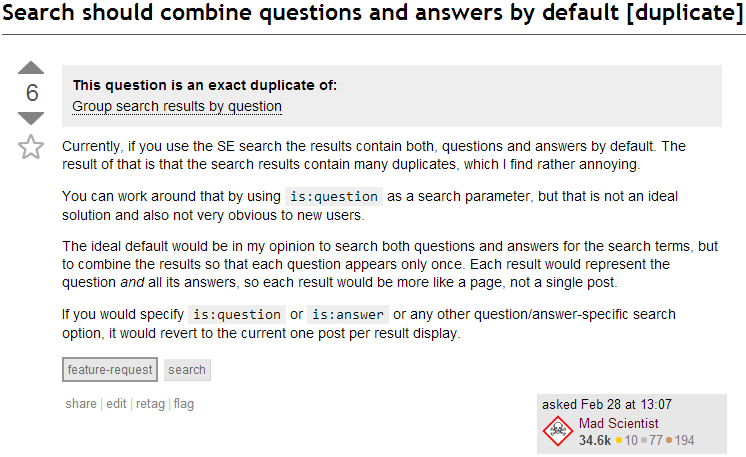 Browse other questions tagged feature-request flags duplicate-questions vote-to-reopen .